The team at XL Displays raised over £200 for Macmillan Cancer Support on Thursday 12 February. They hosted a Stella & Dot jewellery party, held a raffle and also took part in a ‘Great British Bake Off’ style cake sale. 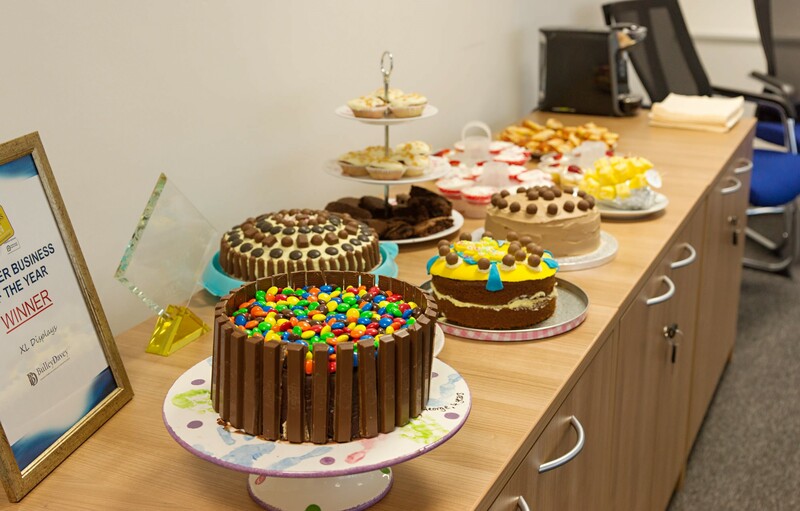 Staff entered their home baked cakes and colleagues paid to taste and give marks out of 10. Joanne Bass, Director of XL Displays said, "I am so pleased we have been able to raise such a sum for Macmillan Cancer Support. It was a great event and the whole team made a huge effort”. Jo continued, "We held this fundraiser in memory of our dear friend and colleague Abi Brown, who lost her fight to cancer just over a year ago. For her, and in the memory of others we have known who have been lost to cancer, we wanted to do something to contribute to this incredible charity. Macmillan Cancer Support helps many people fighting cancer and those who have been affected by it in some way, they are a remarkable charity that is close to many people, and one we hold close to our hearts”. "I'd like to thank all our staff for taking part and making it such a fun event and Leanne Lewin from Stella & Dot who generously donated 10% of sales and a raffle prize. Also, the other local businesses which supported us by donating a raffle prize – The Cuckoo, Fishtastic, El’esteem and Zula Beauty Sanctuary”. XL Displays is the current holder of the Peterborough Telegraph's Smaller Business of the Year Award. Based in Orton Southgate, XL Displays are manufacturers and suppliers of bespoke exhibition stands and portable exhibition equipment.